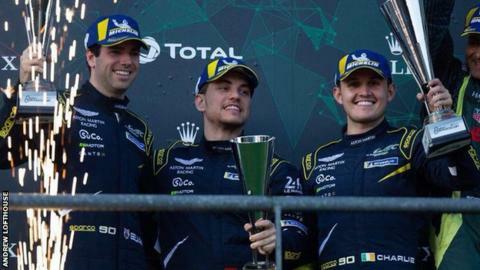 Northern Ireland duo Charlie Eastwood and Andrew Watson have been confirmed as Aston Martin Junior Drivers. Watson, who was previously in McLaren's academy, joins Eastwood as the only other factory Junior Driver for 2019. The pair will become a reserve for the Factory Professionals and also assist development and testing of new cars. Also, they will mentor drivers the re-launched Academy on top of racing duties. "I'm delighted to sign this contract with Aston Martin Racing," said Eastwood, who is only in his second year of endurance racing, "I'm still relatively new to the discipline and the results and pace have been good. I've proven my consistency over stints at a very high level. "Joining Aston Martin is a real privilege and I will continue to work hard and develop my role in terms of test and development, but also in data analysis and mentoring of the Academy drivers." Donaghmore driver Watson had a breakthrough year in 2018 as he picked up his first overall podium in the Blancpain GT Series and took class pole at the Spa 24 Hours. "To sign with Aston Martin Racing as an AMR Junior is a hugely proud moment for me and a massive step in my career," said the 24-year-old, who will announce his 2019 plans next week. "They have huge ambitions, much the same as myself as a young driver, and I'm massively excited by what lies ahead and am looking forward to building a strong relationship with AMR into the future." "I'm really delighted to be flying the flag for Aston Martin Racing and the opportunity to help the team with the car development is extremely unique and one I'm really excited for."